Pioneer Square has an unprecedented number of projects impacting the public realm: reclaiming alleys, redesigning streets and parks, fixing curbs and medians, waterfront, parking, and bike lanes. All this and more are all-in-a-day’s work for Liz Stenning, our Public Realm Director. A friendly and familiar face in the neighborhood, Liz is all about ongoing improvements to our public realm from curb cuts to crosswalks. On a sunny Thursday afternoon, Liz stands near the Washington Street Boat Landing, where South Washington Street meets the Alaskan Way pedestrian walkway. 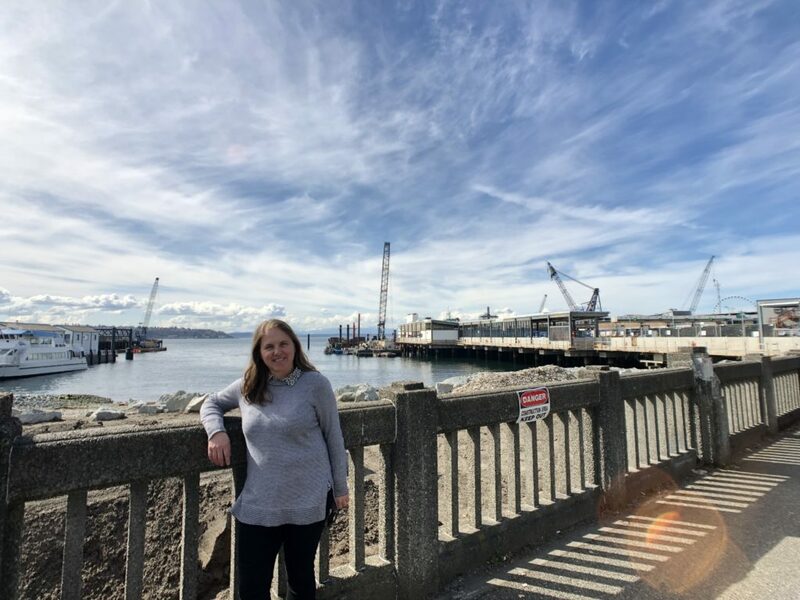 “People may not be aware of the environmental features that are part of the Washington Street Boat Landing and the Waterfront project,” Liz points out as she looks out upon the Puget Sound past the numerous boats moored near Coleman Dock. The Washington Street Boat Landing restoration project, which the Alliance for Pioneer Square is actively involved with, is part of a larger effort to re-activate Seattle’s Waterfront following the removal of the Alaskan Way Viaduct. Liz points out two unique features of this area – the recently constructed seawall and the nearby habitat beach. In 2017, the City of Seattle completed major elements of the Seawall Project, replacing the aging, failing seawall along the waterfront and improving the lost nearshore environment, including improved salmon migration corridors. In time, native plants, birds, and wildlife will lay claim to the habitat beach near the Washington Street Boar Landing, whose tide-marked shore is already accruing piles of driftwood. The Washington Street Boat Landing project includes the restoration of a nearly 100 year old boat landing and pergola. The boat landing and Pergola were restored and returned to their current location in 2017, after their removal to allow for the construction of the seawall construction. While in storage, the pergola was historically restored after languishing for years. The pergola now has a bright future, with potential plans to activate the interior. 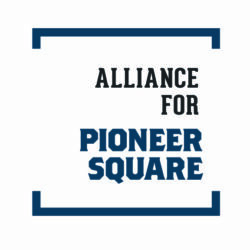 This week, Liz is excited about the Pioneer Square East West Streets open house, co-hosted by the Office of the Waterfront & Civil Projects and the Alliance for Pioneer Square. 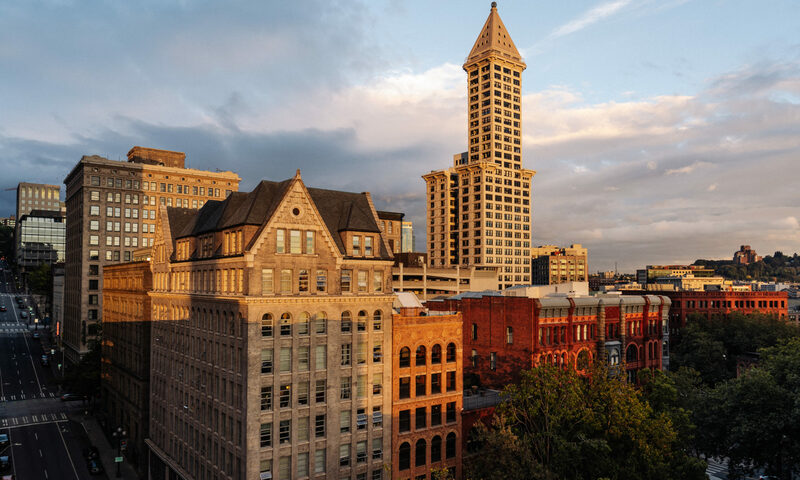 The event features a walking tour of the neighborhood, along with an open house held at AXIS Pioneer Square, to highlight an effort to improve east-west streets in the heart of Pioneer Square. The streets include Main, Washington, King, and Yesler between 2nd Avenue and Alaskan Way. The project design will improve the pedestrian experience and accessibility for people of all ages and abilities. . Liz says the walking tour and open house will continue the conversation and connection between the Pioneer Square community and the new 20-acre waterfront park.